Come join Escape 605 at our downtown location on Wednesdays to play some live trivia! 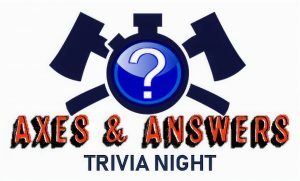 Trivia will begin at 6pm and last one hour. Get EVERY question right, win 4 passes for an hour of AXE Throwing! Didn’t get every question but still answered the most correct for the evening? You win 2 half hour passes for AXE Throwing! Come check out Escape 605’s extensive beer and wine list and join Escape 605 on Wednesdays to play AXES & ANSWERS Trivia!